Fireplace Inserts Hot Water / BEF AQUALITE - Fireplaces, fireplace inserts, stoves of BeF Home, Ltd. Revolutionary hot-water fireplace inserts designed for houses with low heat loss. This series of fireplaces due to low-power operation capabilities is not subject to annual statutory inspections of the technical condition and operation of combustion stationary sources. Fireplace insert BeF Aqualite is already equipped with the triple glass in standard. An innovative air supply for combustion brings a better use of the performance for the water heating. It is equipped with a revolutionary glass cleaning system consisting of the internal cooling of a special triple glass. This ensures minimal heat transfer through the glass to the space in which it is located and increases the heat exchanger performance. And not only that, thanks to this solution, the surface of the fireplace glass is considerably cooler and therefore even safer for children. The innovative solution of the hot-water heat exchanger design ensures the most efficient heat removal and, at the same time, makes it much easier to clean the furnace. This eliminates the necessity of installing the inspection opening in the smoke flue, as well as in the surround, in places which have not been aesthetically suitable. The furnace of our fireplace inserts is laid out by a massive layer of special storage material Carcon, which was developed for our company. This lining contributes to high combustion efficiency and high purity. It has excellent both accumulation and strength properties and thus ensures the perfect burning of the wood. The body of the fireplace insert is covered by thermal insulation. 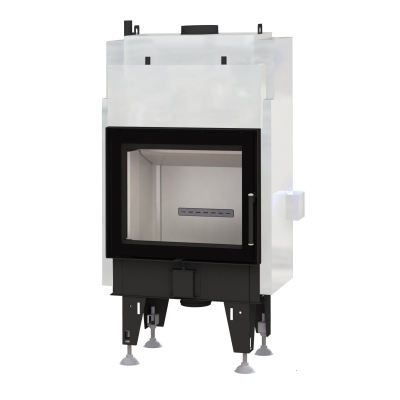 These hot-water fireplace inserts meet the strictest European emission standards and have one of the highest combustion efficiencies in the market. At the same time they are equipped with a cooling loop that ensures safety during heating. These fireplaces are the best among hot-water fireplace inserts for economy houses. Our BeF Aqualite fireplaces are able to heat the house for low price while creating warmth comfort of the home.